You’ve built a beautiful website, but it’s not showing up on Google yet. This might leave you feeling like a wallflower at a dance, wondering how to get the big search engines to notice you. Google handles billions of websites every day. How does it do that…and how can you get a little more attention? Let’s take a look at how Google indexes, analyzes and then ranks a website, and what you can do to help the process along. Just like phonebooks in the old days, search engines have a large index of all the pages on all the websites that they know. Your site can only show up in SERPs (the acronym for”search engine results pages”) if it is in that database. To find new websites, search engines use crawlers: virtual bots that automatically visit websites. All day, every day. Crawlers look each website up and down: they look at the text, image descriptions, and all the links on the site. At this point, they just want to know what’s there so they can analyze it later. Before your site can appear in the search results, the search engine must know it exists. In technical terms, we want the search engine to add your site to its index of known websites. That’s the first thing to work on: anything you do to optimize your site can only make a difference if the search engine sees your site in the first place. If your site is new, search engine crawlers will find it eventually, likely in a few days or weeks. 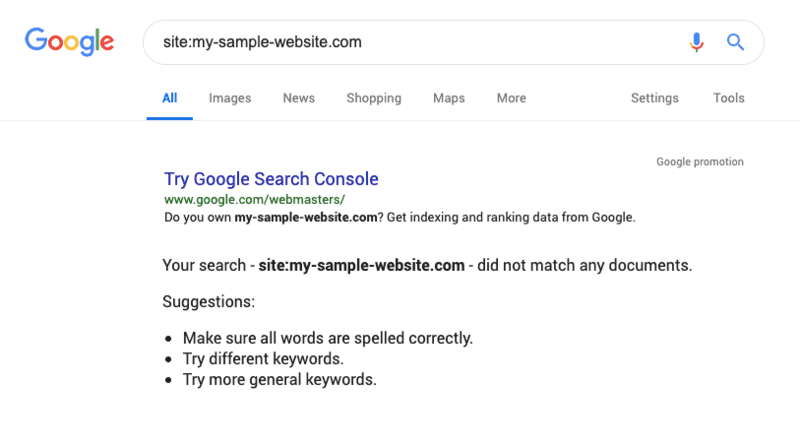 But if you’d like to hurry the process along, the best way to get it indexed quickly is to sign up for a free Google Search Console account and use its URL Inspection Tool. Or, if you have a Jimdo Dolphin website, you can use the SEO tools to automatically submit it for indexing. This process only takes a moment, but you can be absolutely sure that a crawler will visit your website ASAP. Much better than sitting around waiting for something to magically happen. Has your site already been indexed? A quick check will tell you if Google knows your website exists yet. If it doesn’t, don’t worry—it will soon. Once the crawler knows your site exists and what’s on it, it’s time to analyze what it finds. That analysis ends in a ranking: a list of pages on the internet that best match a certain search phrase. There are many things Google looks at when analyzing a website. The search engine wants to know what your site is about, and more importantly when it should show your website to people searching. The search engine tries to find out which search phrases your website is a good match for. There’s a little bit of subtlety to this process that Google’s algorithms have gotten better and better at figuring out over the years. For example, if your site is about coffee, should it show up when people look for the best place to drink coffee in your city or should it show up when people look for a good coffee supplier for their own cafe? Search engine algorithms can look at your content, “read” your text, and answer that question. Once the search engine has done its analysis, it then wants to figure out if your site is more or less relevant for those search phrases than other competing websites. To do that, it uses around 150 different ranking factors (and some say there are even more). Some of those have more importance than others. Unfortunately, there isn’t an easy list to follow of all the different ranking factors. Google and other search engine don’t tell us exactly what they look for because they don’t want us to start manipulating the search results. Luckily, they do offer general guidelines. People who work in SEO often do tests as well, to see how search engines handle content on a website. Do a little bit of keyword research to get ideas of which search phrases you want to target. (Here’s some advice on quick and easy keyword research ideas for non-experts). Open up the SEO settings on your website and fill in any blank fields, like your Homepage Title and Website Title. Use these fields to describe what your site is about, using some of the keywords you’re targeting. Add Headings to your website to give your text structure (search engines use these headings to help understand what your site is about and how it’s organized) and fill in the Alternative Text fields on your images. Improve the content of your website. SEO settings will get you only so far. The most important factor in search engine ranking is having high-quality, relevant text on your website. Make just a few tweaks in your SEO settings to improve your search engine ranking. So, your site has been indexed. And you’ve made a few changes to optimize for some search phrases. What happens now? Now, we wait. Before your changes have an effect in search results, the crawler needs to notice them first. On its next visit, the crawler will look at your site to see if anything has changed since the last time it was there. Basically, it wants to know: is there a reason for me to change the way I show this site to searchers? How often your site is crawled is different for each website. Google’s logic there seems to be based on keeping the search results relevant and up to date. If you run a very popular national news website with new original content every hour, crawlers will visit your site often. If your site only changes once a year, your next crawl will take longer. That’s why it’s a good idea to check in regularly and keep all of your information fresh. Once your site has been re-crawled and analyzed again, it may change a few positions for a certain search phrase. It may even drop positions for another search phrase. Login to your Search Console account. You can now see your website’s position for search phrases that people look for. If your website has been around for a while, you may get visitors from many different search phrases. In most cases, you shouldn’t expect to jump to the number one position straight away. But don’t be discouraged. Getting there takes time and is the result of a lot of small steps. As you grow your traffic and add content to your site, your ranking should improve over time.